Trimetazidine, Non-ST segment elevation acute coronary syndrome (NSTE-ACS), High-sensitivity Creaction protein (hs-CRP), N-terminal pro-B-type natriuretic peptide (NT-pro-BNP), High-sensitivity cardiac troponin T (hs-cTnT). Acute Coronary Syndromes (ACS) is a serious type of coronary heart disease and a leading cause of mortality worldwide. The morbidity of ACS is gradually increasing in developing countries, especially China. Non-ST segment elevation acute coronary syndrome (NSTE-ACS) accounts for 90% of all ACS patients. NSTE-ACS patients are often characterized by paroxysmal symptoms, such as chest pain and chest tightness, which may lead to cardiac arrhythmia, heart failure and death . NSTE-ACS is much more common in patients who suffer from hypertension, diabetes, hyperlipidaemia and with a familial inheritance of early onset coronary artery disease . Trimetazidine (TMZ) exerts direct cytoprotective effects in acute myocardial ischemia via the selective inhibition of 3-ketoacyl-CoA thiolase (3-KAT), which promotes the generation of cardiac energy metabolism and a decrease in vascular resistance. TMZ preserves energy metabolism and the necessary ATP levels in ischemic myocardium cells, which reduces myocardial intracellular acidosis and injuries. Therefore, TMZ participates in inflammation regulation and protects ischemic myocytes directly . Recent studies found that TMZ is an effective treatment for ACS, heart failure and the inhibition of inflammatory reaction in addition to ischemic cardiomyopathy and angina pectoris . Several classes of hypolipidaemic agents are successfully used for clinical combined antithrombotic therapy, such as statins and fibrates, but conventional hypolipidaemic statins and fibrates possess side effects, such as severe muscle damage (elevation of transaminase, myopathy rhabdomyolysis and rhabdomyolysis), with long-term use. Many patients with NSTE-ACS fail to fully recover despite intensive therapies with effective drugs and remain at risk of further cardiovascular events . Therefore, different approaches to develop novel therapies are on-going [6,7]. This study investigated serum hs-CRP, pro-B-type, hs-cTnT and plasma lipid levels before and after the onset of TMZ treatment in NSTE-ACS patients and the effect of early interventional treatment with TMZ. The present study included 124 patients who were diagnosed with NSTE-ACS in the cardiology department of the Second Affiliated Hospital of Shandong University, from Nov 2012 to Mar 2014. 67 male patients aged 43-75 y and 57 female patients aged 45-76 y were included. The ethical committee of the Second Affiliated Hospital of Shandong University approved this study and all participants gave written informed consent. (1) The diagnostic criteria for NSTE-ACS in accordance with the World Health Organization (WHO) and the American Heart Association (AHA) diagnostic criteria for acute coronary syndrome; (2) No contraindications for trimetazidine; (3) No ST-segment elevation on 12-lead electrocardiogram examinations. (1) STEMI patients suitable for emergency direct percutaneous coronary intervention; (2) Patients with trauma, surgical bleeding tendency, and acute or chronic infection due to increased hs-CRP; (3) Patients who had surgery in previous two weeks; (4) Patients who presented with combined cerebrovascular accident or vascular disease; (5) Patients with combined liver and kidney function failure or insufficiency, cancer, blood diseases, infectious diseases, chronic connective tissue diseases and immune systemic diseases; (6) Patients with immune diseases and a previous history of myocardial infarction. A total of 124 patients who met the above criteria were randomly assigned to three groups. Forty patients in group A were only given conservative therapy, including oral enteric aspirin (200 mg/d), clopidogrel (75 mg/d), isosorbide dinitrate (50 mg/d), and a subcutaneous injection of low-molecular heparin calcium (5000 units/d). 44 patients in group B were given conservative therapy plus 20 mg/d TMZ (SERVIER (Tianjin) Pharmaceutical Co., Ltd. approved by H20055465) QD before dinner. 40 patients in group C were given conventional therapy plus 60 mg/d TMZ (3 × 20 mg), TID before meals. The treatment course of the three groups was 8 weeks, and the effects and adverse reactions were observed. The following indicators were evaluated before and after treatment onset: (1) hs-CRP levels were detected using latex enhanced immune turbid metric method; (2) NT-pro-BNP, hscTnT, high-density lipoprotein-cholesterol (HDL-C), and lowdensity lipoprotein cholesterol (LDL-C) levels were detected using a Hitachi 7020 automatic biochemical analyser; (3) Major cardiovascular adverse events, including heart failure, bleeding, arrhythmia, and death, and other adverse events, including gastrointestinal symptoms and nervous system reactions, such as headache, sleep disorder, and cutaneous allergic reactions, were recorded; (4) The atherogenic index (AI) was calculated using the formula, log (TG/HDL-C). All analyses were performed using SPSS 18.0 (SPSS Inc., Chicago, IL, USA). Measurement data were compared using a t-test, and the results are expressed as the mean ± SD (x ± s) or percentages for categorical variables. The χ2 test was used for categorical variables. P<0.05 was considered statistically significant. A total of 124 patients were randomly divided into three groups: group A (control group), group B (low-dose TMZ group) and group C (high-dose TMZ group). Table 1 reports patient characteristics at enrolment. There were no significant differences in general characteristics, such as gender, age, hypertension, diabetes, hyperlipidaemia, smoking, drinking and other risk factors (P>0.05). All patients (n=124) completed the trial. Table 1. General data of the study population. 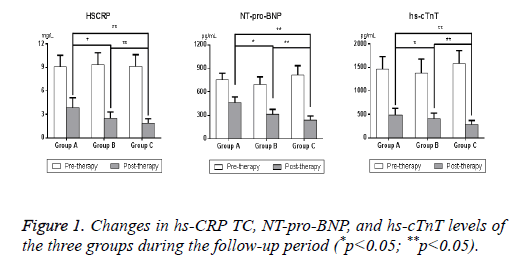 The results demonstrated that hs-CRP, NT-pro-BNP, and hscTnT levels of the three groups were similar before treatment (P>0.05) (Figure 1). Significant decreases in hs-CRP, NT-pro- BNP, hs-cTnT levels were observed in group B and group C after TMZ intervention compared to group A (P<0.05). hs- CRP was decreased by 79.43% in group C, which is approximately 10% higher than group B and 22% higher than group A. NT-pro-BNP was reduced by 71.06% in group C, which is 16% higher than group B and two times group A. HscTnT also exhibited a 82.28% reduction in group C, which is 12.21% higher than group B and 18.32% higher than group A (Table 2). Notably, the decrease of hs-CRP, NT-pro-BNP, and hs-cTnT levels in group C (high-dose TMZ (60 mg/d)) was greater than group B (low-dose TMZ (20 mg/d); p<0.01). Figure 1: Changes in hs-CRP TC, NT-pro-BNP, and hs-cTnT levels of the three groups during the follow-up period (*p<0.05; **p<0.05). Table 2. Hs-CRP, NT-pro-BNP and hs-cTnT before and after treatment onset. LDL-C, HDL-C, and AI levels in group B and group C changed to various degrees compared to group A after treatment onset compared to before treatment. TMZ lowered LDL-C levels by 19.84% in group B and 46.07% in group C and increased HDL-C levels by 9.19% in group B and 36.74% in group C (Table 3). The high-dose TMZ group demonstrated a conspicuous elevation in HDL-C and a significant reduction in LDL-C (p<0.05) (Figure 2). TMZ significantly decreased AI by 55.63% in group C, 22.86% in group B and 6.53% in group A. The level of AI was reduced more drastically in group C compared to group B and group A (P<0.01), which suggests that TMZ helped alleviate atherosclerotic risk in NSTE-ACS patients. Our tests preliminarily revealed that cardiovascular biomarkers (e.g. hs-CRP, pro-B-type, and hs-cTnT) positively correlated with plasma lipid levels during the development and treatment of NSTE-ACS. Table 3. LDL-C, HDL-C, and AI before and after treatment onset. Figure 2: Changes in LDL-C, HDL-C and AI levels of the three groups during the follow-up period (*p<0.05; **p<0.05). Similar major adverse events, including headache, diarrhoea, and in appetence, between the three groups were observed (P>0.05). No patients experienced severe cardiovascular adverse events, which indicates that the addition of TMZ to conservative treatment was safe (Table 4). Table 4. Adverse events in the three groups. The pathogenesis of NSTE-ACS is primarily due to the large number of inflammatory cells gathered in coronary artery atheromatous plaques, which contain LDL-C as a lipid core and an outside fibrous cap. Endothelial cells activated by inflammatory factors, which are induced by excessive lipids, and the resulting plaques are unstable or rupture to further induce thrombosis [8,9]. NSTE-ACS patients with multi-vessel coronary arteries frequently present multiple and severe stenosis but not fully occluded infarct-related arteries. Recent studies of NSTE-ACS provide a new understanding of the pathophysiological mechanisms and the development of novel clinical treatment strategies. The medical profession gradually recognized that LDL-C and persistent inflammation play key roles in the development of NSTE-ACS or the formation of atheromatous plaques, and atheromatous plaques are the primary culprit of atherosclerosis and thrombosis . Interventional therapies and coronary artery bypass surgery are extensively utilized treatments, but drug therapy remains the basis of coronary heart disease treatment, especially high-risk cardiovascular patients who are unfit for surgery. TMZ is an anti-ischemic metabolic agent that protects the ischemic myocardium by enhancing myocardial energy utilization during myocardial ischemia. TMZ selectively inhibits free fatty acid oxidation via shifting beta-oxidation acid to glucose oxidation, which results in a more productive pathway for myocardial glucose utilization that is beneficial for myocardial hypo perfusion. TMZ also improves the permeability of the calcium pathways and protects respiratory chain activity under anaerobic conditions. Our clinical observations demonstrated that the addition of TMZ to conservative treatment profoundly down regulated the risk of coronary heart disease, as indicated by the suppression of hs-CRP, NT-proBNP, and hs-cTnT in NSTE-ACS patients. The apparently positive correlation between plasma lipid profiles and cardiovascular biomarkers further illustrates the effect of inflammation and lipid levels in arterial thrombotic diseases. Hs-CRP is synthesized by the liver, and its concentration abruptly increases with acute inflammation following cardiovascular events. Hs-CRP is a prediction factor in cardiovascular events, and it is an important marker in distinguishing low levels of inflammation . Large prospective clinical studies demonstrated that hs-CRP participated in the pathophysiological process of acute cerebral infarction via a variety of mechanisms. The serum hs-CRP level is a sensitive indicator of the clinical disease of atherosclerosis, and it is directly related to the incidence and severity of atherosclerosis and Acute Cerebral Infarction (ACI) . Studies also demonstrate that hs-CRP can be used to evaluate the severity of cardiovascular disease, and an obvious increase during the early stage indicates a poor prognosis . Epidemiological studies demonstrated that patients who exhibit higher hs-CRP levels suffer from acute stroke and myocardial infarction risk that is slightly higher than normal healthy people. . Hs-CRP assays are increasingly used as a marker for infectious disease diagnoses and a prognostic tool in cardiovascular disease, which provides important guidance for clinical diagnosis and the choice of therapy. B-type Natriuretic Peptide (BNP) is a sensitive index for cardiac function that is synthesized and secreted by the ventricular myocardium. BNP and its cleavage remnant NTproBNP are released in response to increases in volume or pressure and are present in relatively low concentrations in storage granules. NT-proBNP has the advantages of a long elimination half-life compared with BNP, and it is stable in vitro. Hs-cTnT is also recognized as a myocardial damage indicator, and it exhibits high specificity and a positive correlation with risk of death in NSTE-ACS patients . HscTnT is quickly released into the bloodstream after myocardial injury. Various studies demonstrated that the cardiovascular biomarkers hs-CRP, NT-proBNP, and hs-cTnT are inherently connected in the risk assessment of patients admitted with NSTE-ACS [16-19]. The risk indicators hs-CRP, NT-proBNP, and hs-cTnT generally provide incremental prognostic information after the occurrence of ACS. This study found that hs-CRP was the strongest predictor, followed by NT-proBNP and hs-cTnT. These results may be considered in clinical assessments to stratify the risk of ACS patients. Our clinical results also suggest that high-dose TMZ exhibits significantly elevated HDL-C and reduced LDL-C and AI (P<0.01), which are important in reducing the possibility of further cardio-cerebrovascular diseases. Our study found that TMZ decreased hs-CRP levels and contributed to the reduction in plasma lipid metabolism levels. These results indicate that the hypolipidaemic effect of TMZ may occur via the decrease in hs-CRP level. In conclusion, early interventional treatment with trimetazidine in NSTE-ACS patients remarkably decreased hs-CRP NT-pro- BNP, hs-cTnT and plasma lipid levels. The addition of comprehensive trimetazidine to conservative therapy reduced cardiovascular inflammatory responses and hyperlipidaemia and exerted cytoprotective effects on acute myocardial ischemia. Angiolillo DDJ. The evolution of antiplatelet therapy in the treatment of acute coronary syndromes. Drugs 2012; 72: 2087-2116. Docherty A. Acute medical management of the non-ST-segment elevation acute coronary syndromes (NSTE-ACS) in older patients. Archiv Gerontol Geriatrics 2009; 51: 129-134. Zhang GP. Application of trimetazidine in treatment of acute coronary syndrome. Int J Intern Med 2009. Stefano S, Nuccia M, Alice S, Silvio K. Target populations and relevant therapeutic end points to further improve outcomes in NSTE-ACS patients. Future Cardiol 2009; 5: 27-41. Kandzari DE. Current concepts in the antithrombotic management of non-ST-elevation acute coronary syndromes. Curr Cardiol Rep 2004; 6: 279-286. Atmakuri SR, Kleiman NS. Unstable angina and non-ST segment elevation myocardial infarction (acute coronary syndromes). Cardiol Clin 2003; 326: 1259-1261. Daga LC, Kaul U, Mansoor A. Approach to STEMI and NSTEMI. J Assoc Physic India 2011; 59: 19-25. Deb S, Dasgupta A, Lahiri P. One step Nano sensor for single and multidrug resistance in acute coronary syndrome (ACS). US8546092 2013. Cayla G, Silvain J, O'Connor SA, J-PC, Montalescot G. Current antiplatelet options for NSTE-ACS patients. QJM 2012; 105: 935-948. Hui-kang C, Ye Z. Non-ST-segment elevation acute myocardial infarction treatment options. Chinese J Med Guide 2012; 3: 044. Dubey RK, Dhakal N, Das BKL, Pandey NK, Baral N, Lamsal M. C-reactive protein in patients with nstemi acute coronary syndrome. J Univ College Med Sci 2013; 1: 10-14. Assadpour PM. The correlation between high-sensitivity c-Reactive protein (hs-CRP) serum levels and severity of coronary atherosclerosis. Int Cardiovas Res J 2014; 8: 6-8. Pan D, Zhang Z. Clinical value of high sensitivity c-Reactive protein on AOPP and prognosis of patients with the disease to determine. J North China Coal Med Univ 2011. Abu-FM, Behbehani K, Elkum N. Comprehensive analysis of circulating adipokines and hs-CRP association with cardiovascular disease risk factors and metabolic syndrome in Arabs. Cardiovas Diabetol 2014; 13: 1-10. Thygesen K, Mair JH, Plebani M, Venge P, Collinson P, Lindahl B. Recommendations for the use of cardiac troponin measurement in acute cardiac care. Eur Heart J 2010; 31: 2197-2204. Harutyunyan MJ, Mathiasen AB, Winkel P, Gotze JP, Hansen JF, Hildebrandt P. High-sensitivity C-reactive protein and N-terminal pro-B-type natriuretic peptide in patients with stable coronary artery disease: a prognostic study within the CLARICOR trial. Scand J Clin Lab Invest 2011; 71: 52-62. Lindahl B, Venge P, James S. The new high-sensitivity cardiac troponin T assay improves risk assessment in acute coronary syndromes. Am Heart J 2010; 160: 224-229. Demirelli S, Karakelleoglu S, Gundogdu F, Tas MH, Kaya A, Duman H. The impact of trimetazidine treatment on left ventricular functions and plasma brain natriuretic peptide levels in patients with non-ST segment elevation myocardial infarction undergoing percutaneous coronary intervention. Korean Cir J 2013; 43: 462-467. You FJPSH, Suzhou. Analysis of relationship between blood lipid metabolism levels and hs-CRP levels in patients with chronic obstructive pulmonary disease. J Radioimmunol 2011.